Of course, there are a lot more lessons to be taught, but these just happen to be a few that embarking upon our Rover journey ended up teaching our children. If you aren’t sure what Rover is, or how it could potentially help you teach your children valuable lessons, then here we go! My 10-year-old daughter is the one who brought Rover to my attention in the first place. I was at a financial conference for one of the large groups I am part of, called FinCon, for us financial nerds, when she first emailed me about it. I told her we would speak about it when I got back from my trip, and as soon as my feet hit the threshold she was on me like white on rice about Rover. She had done all of the research while I was gone and was fully armed with all of the necessary information to propose the idea to me. Because she knows how I am, in that if you want me to consider something, I want you to have done the research ahead of time and sell me on it. This is a lesson I have been teaching them since they were little because I want to help hone their negotiation and problem-solving skills for life. This may sound like a lot, and it did take some time, but it has been a great ride so far! Once our Rover profile was approved and set up, we started getting requests for dog boarding within the first 24 hours. Which was awesome! I can tell you that we end up boarding dogs more than any of the other services. And the kids love it! We have been so busy since we started doing this in November, that we have multiple dogs staying with us almost every single night. In fact, for the next couple of weeks, we have up to 5 dogs a night with us. Which gets a bit hairy! While this can get a bit insane, there have been some really valuable lessons to come from this experience thus far. I can be honest and tell you that we weren’t really sure how this was going to pan out since we have 5 kids and work some crazy hours sometimes. But, it has actually worked out really well so far! We don’t have a dog of our own because we have so many kids. We didn’t want to get one either, because we figured it would just end up being one more thing we had to get them to take care of. But with Rover, the kids are excited to have dogs stay with us. They get really excited when they come back to see who we have. Plus, they fight over who gets to help feed, walk and brush them. They all want to play outside with them by throwing sticks and balls. The kids have really been working well on the teamwork front, which is something we love to see as parents. They have also learned to be more compassionate with animals. Because I have a background working with animals, as well as in human and animal nutrition, we have a tendency to get some animals that require more care. The kids have been really good about learning which issues an animal has and being respectful and helpful with it. I love to see this! Picking up dog poop and cleaning up messes in the house is still something they aren’t big fans of. But, unfortunately for them, it is part of the job. This is a good lesson for them because I want them to understand that jobs aren’t always going to be all fun and games. Sometimes, there are going to be parts of a job that you don’t like. But it is still part of the job and has to be done. Preferably without whining! 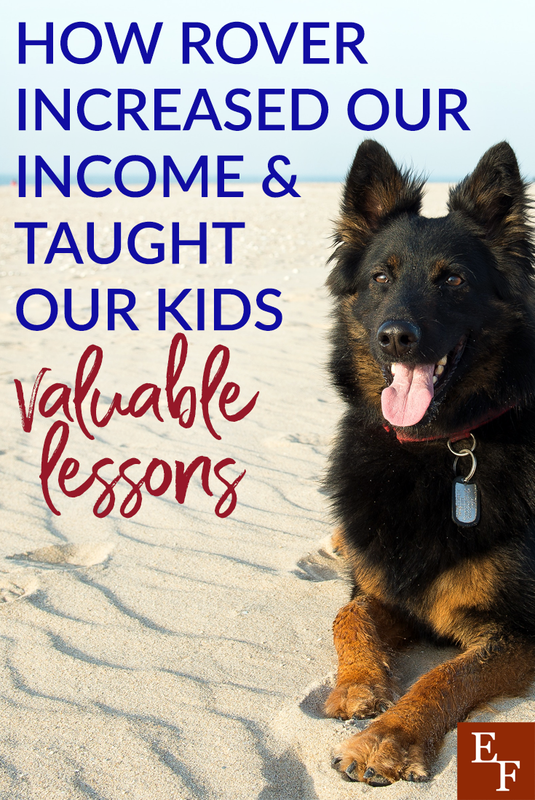 Besides teaching them some great life lessons, doing Rover has also taught them some monetary lessons. Since I run Rover through my business, I can legally pay my kids to do anything Rover related. Since all of these things are a necessary part of the job, I love being able to outsource a lot of this work to them. Two of the kids are mine biologically, and I am a sole member LLC, the IRS states that my children are exempt from paying Social Security or Medicare taxes. Plus, since my two biological children now have “earned income,” I was able to open a Roth IRA for Minors and put all of the money they make from me into those accounts. We opened ours at Fidelity since I already had a retirement account with them. The only other option I found, that offered this type of account, was Charles Schwab. Both are great companies, but hopefully, there will be more options for these accounts in the near future, as people realize what great teaching tools they are for children. Since the average rate of return is 10% annually (not accounting for 2-3% annual inflation though), they will really be ahead of the game. Especially since they are 10 and 13 now! My daughter was so excited to learn about compounding and what the average rate of return was, that she and my son are now in a contest to see who can hit a million dollars first. This is a huge parenting win in my book! Have you tried Rover yet? If not, what other ways have you found to teach your children such great lessons about life and money?